Somerville, MA For many years Harold Brown, whose 64-year-old Hamilton Co. owns two million s/f of commercial real estate in Greater Boston, had been eying Union Sq. as an area poised for new growth. So when a soon-to-be abandoned warehouse and parking lot at 2 Union Sq. became available in late 2013, Harold Brown, now 93, and his son Jameson, Hamilton’s CEO, didn’t hesitate to buy the 15,600 s/f property for $1.9 million. Little did they know at the time, however, that the now-renovated 7,400 s/f building, formerly the site of Riverside Motor Sports, would become home to the Boston-area’s first ax-throwing venue. Urban Axes, a Philadelphia-based chain whose patrons delight in throwing a 1.5 lb. ax at a wooden bullseye target 14-feet away, opened its doors at 2 Union Sq. on December 7. For Harold Brown, ax-throwing is a far cry from making donuts, which was his first commercial venture in the city’s Davis Sq. 60 years ago. Brown, who recently received a Lifetime Achievement Award from the New England Real Estate Journal, had to sell the donut shop when, after serving in World War II, he was called back to service in 1950 for the Inchon Invasion in Korea. For Jameson Brown, 31, renovating the 2 Union Sq. property and working hand-in-hand with Urban Axes on its unique ax-throwing entertainment theme was a rewarding–and challenging experience. “When we first saw the property at 2 Union Sq., the building was literally falling apart. The façade was crumbling, the roof had massive leaks, the garage doors were not flush with the ground and the flooring was not stable,” said Jameson. About the same time, rumors were rampant that the city might take the property by eminent domain as part of a master plan for redevelopment of the Union Sq. area. Undaunted, Harold and Jameson Brown persevered, bought the property for $1.9 million and put another $1 million into renovating the dilapidated building. Renovations included replacing the old roof, installing new sprinkler systems, water and sewer lines, flooring and ADA-compliant bathrooms, and replacing half of the building’s façade. “Once we started seeing the results of these improvements, we felt we would be able to secure a tenant. That’s when we struck the deal with Urban Axes,” said Jameson. 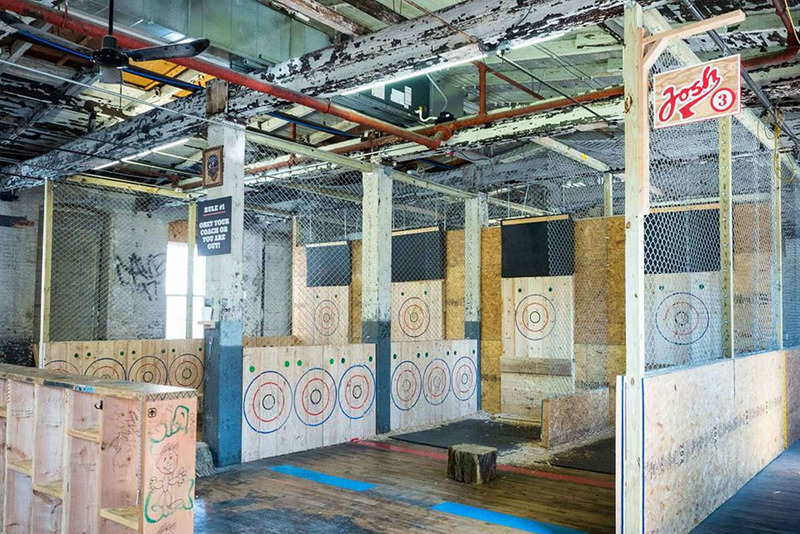 He worked side-by-side with Urban Axes to create a space that fits the entertainment needs of the venue’s ax-throwing patrons. Together, The Hamilton Co. and Urban Axes also entered into an agreement with the Somerville Arts Council, a department of the city, authorizing internationally-acclaimed street artist Victor “Marka27” Quinonez to paint a contemporary mural on the west wall of the building. Jameson Brown views the mural as a welcome addition to The Hamilton Co.’s renovations at 2 Union Sq.